Real Wood, Salvaged, Rustic Fireplace Mantels | Redwood Burl Inc. 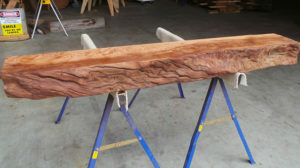 Custom carved redwood mantel from ethically salvaged California redwood. By all means, rustic fireplace mantels from salvaged redwood are one of our most popular reclaimed wood items. Each one is made from solid, salvaged California coastal redwood. The rustic look means the wood has a live edge and tends to have minor “defects” such as small cracks, knots, and curly or burly character. Truly, it is these so-called imperfections that make each piece of redwood incredibly unique. Naturally, our live edge fireplace mantles are a perfect fit for a touch of rustic decor to your home, log cabin, or vacation getaway. Of course, if you are looking for a clean, solid wood piece, we will gladly find a fit for you. Salvaged redwood reveals a variety of natural characteristics. We have a large selection of wood fireplace mantels for you to choose from. Additionally, we can cut any of our mantles smaller to fit your specifications. We have thousands of rustic fireplace mantels in our inventory and only a portion of them are online. If you don’t see what you’re looking for online, feel free to contact us for more options. M-101 - 100" x 12" x 5"
- 71" x 12" x 5"
- 94" x 13" x 5"
- 88" x 12" x 5"
- 74" x 12-16" x 6"
- 96" x 10" x 6"
- 65" x 10" x 4"
- 59" x 10" x 4"
- 60" x 14" x 5"
- 94" x 13-24" x 7"
- 76" x 12" x 4"
- 96" x 11" x 6"
- 101" x 11" x 5"
- 53" x 16" x 4"
- 91" x 12-18" x 6"
- 50" x 10-16" x 5"
- 82" x 15-27" x 5"
- 83" x 20" x 6"
- 78" x 14" x 7"